Brian Powell and other researchers at Indiana University conducted a study of 2000 people to tease out people’s attitudes about discrimination. Participants were presented with a scenario of an engaged couple going to a wedding photographer and being turned away. Overall, 53% of people thought that discrimination should be legal when it’s against the gay couple, and 39% said it should be legal to refuse to serve an interracial couple. But people didn’t really care if a religious reason was given or not: about the same percentage of people thought it should be legal to discriminate based on religious disapproval or non-religious disapproval. 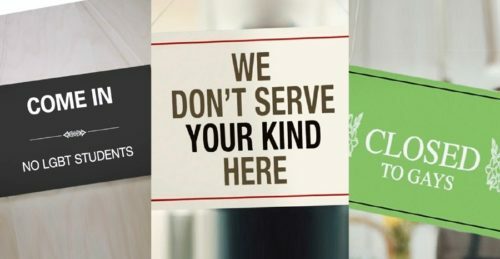 What participants did care about was the type of business that was discriminating; they were twice as likely to say that a sole proprietorship should be allowed to discriminate than a large chain store. People of different backgrounds answered the question differently, too. LGB, Black, and Hispanic people were less likely to tolerate discrimination in either scenario than white, straight people. Older people and men were more likely to say that discrimination should be legal than younger people and women. 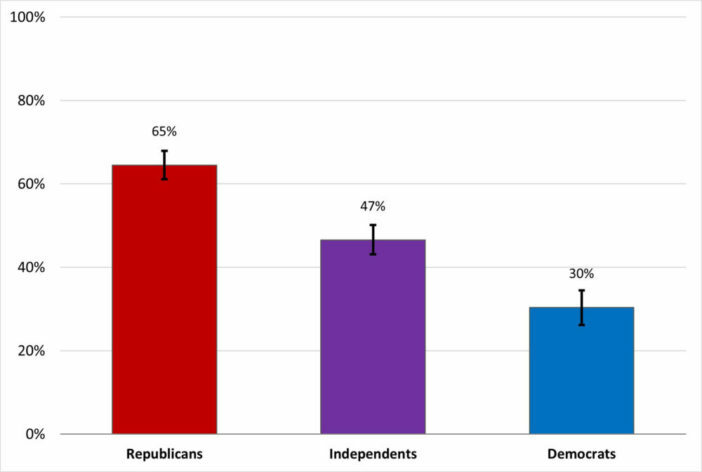 Of course, Republicans favored ending anti-discrimination laws more than Democrats. 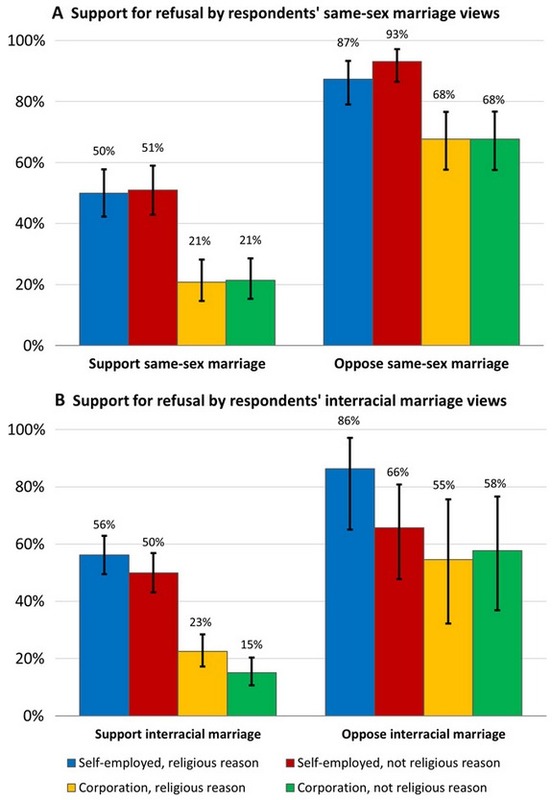 Last, people’s views about the relationships determined their opinions about discrimination laws to some degree, showing that their opinions about anti-gay bakers are often proxies for their acceptance of LGB people. Participants could also explain their reasoning in the study, and Powell said that respondents generally didn’t bring up free speech arguments. Along with “religious freedom,” free speech has been a key argument in favor of dismantling anti-discrimination laws. In the Masterpiece Cakeshop case, the anti-gay baker is arguing that his cakes are art, and the First Amendment protects his right to refuse to sell his art to gay people. Instead, those who favored discrimination made a private/public distinction and often assumed that the free market would take care of the problem. By that reasoning, LGB people, African Americans, Hispanics, and women are more likely to notice that the free market has been around for a while, and yet discrimination continues to happen. What the results show is that Christian conservatives have been smart in recruiting small business owners to sue states to overturn anti-discrimination laws. There is no real reason to distinguish between large and small businesses – they’re both privately owned – but people are more sympathetic to an individual with a face and a story than they are to a large corporation. And a ruling in favor of a small business that wants to discriminate will likely apply to any business. The free speech and religious freedom arguments are important in court and for pundits, but most people don’t care about that. They just don’t like the idea of the government bossing around nice people they identify with.